21 w w w. s p i r i t o f w o m e n . c o m | W I N T E R 2 0 1 8 | S P I R I T O F W O M E N Home care If your vet does find that your pet has an illness or injury requiring medical care, you may be bringing home a convalescing patient who needs medication, monitoring, and most of all—TLC. 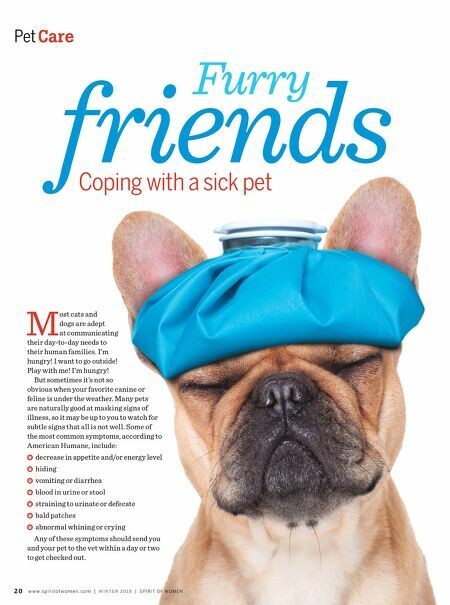 "In some cases we recommend that owners stay home with [an ill] pet and monitor them, depending on the procedure they might have had," says Dr. Kwane Stewart, chief veterinary officer of American Humane and national director of Humane Hollywood. "If it's possible for you to be home for the next few days, that can be helpful." In any case, try to keep your pet in a quiet place where he or she can be away from other pets and young children. Feed the pet separately if he requires a special food, and be aware of any special physical needs he may now have, such as needing to drink and urinate more frequently. If your pet has been sent home with an e-collar (the "cone of shame"), be sure to adhere strictly to the veterinarian's instructions for how long it should be worn. This will help prevent your pet from being able to pick at stitches or a wound, says Dr. Stewart. "It [an e-collar] can be uncomfortable for the dog or cat, so the owner may say, 'Let me just take it off for a while,'" he says. "Then the [pet] goes into the corner and you forget about them, and after a while all the stitches are out. When the vet says leave the e-collar on at all times, take that very seriously." 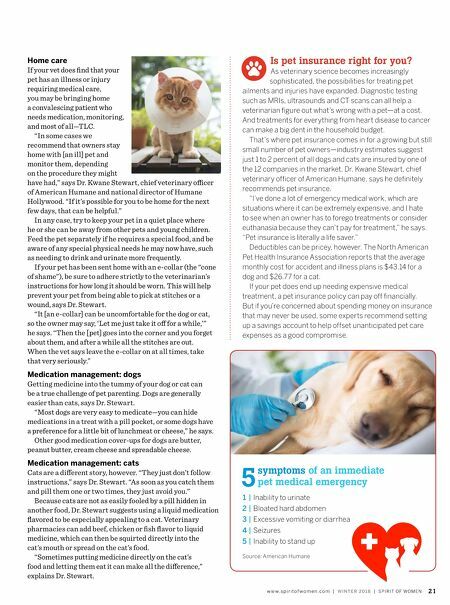 Medication management: dogs Getting medicine into the tummy of your dog or cat can be a true challenge of pet parenting. Dogs are generally easier than cats, says Dr. Stewart. "Most dogs are very easy to medicate—you can hide medications in a treat with a pill pocket, or some dogs have a preference for a little bit of lunchmeat or cheese," he says. Other good medication cover-ups for dogs are butter, peanut butter, cream cheese and spreadable cheese. Medication management: cats Cats are a different story, however. "They just don't follow instructions," says Dr. Stewart. "As soon as you catch them and pill them one or two times, they just avoid you." Because cats are not as easily fooled by a pill hidden in another food, Dr. Stewart suggests using a liquid medication flavored to be especially appealing to a cat. Veterinary pharmacies can add beef, chicken or fish flavor to liquid medicine, which can then be squirted directly into the cat's mouth or spread on the cat's food. "Sometimes putting medicine directly on the cat's food and letting them eat it can make all the difference," explains Dr. Stewart. symptoms of an immediate pet medical emergency Source: American Humane 5 1 | Inability to urinate 2 | Bloated hard abdomen 3 | Excessive vomiting or diarrhea 4 | Seizures 5 | Inability to stand up Is pet insurance right for you? As veterinary science becomes increasingly sophisticated, the possibilities for treating pet ailments and injuries have expanded. Diagnostic testing such as MRIs, ultrasounds and CT scans can all help a veterinarian figure out what's wrong with a pet—at a cost. And treatments for everything from heart disease to cancer can make a big dent in the household budget. That's where pet insurance comes in for a growing but still small number of pet owners—industry estimates suggest just 1 to 2 percent of all dogs and cats are insured by one of the 12 companies in the market. Dr. Kwane Stewart, chief veterinary officer of American Humane, says he definitely recommends pet insurance. "I've done a lot of emergency medical work, which are situations where it can be extremely expensive, and I hate to see when an owner has to forego treatments or consider euthanasia because they can't pay for treatment," he says. "Pet insurance is literally a life saver." Deductibles can be pricey, however. The North American Pet Health Insurance Association reports that the average monthly cost for accident and illness plans is $43.14 for a dog and $26.77 for a cat. If your pet does end up needing expensive medical treatment, a pet insurance policy can pay off financially. But if you're concerned about spending money on insurance that may never be used, some experts recommend setting up a savings account to help offset unanticipated pet care expenses as a good compromise.